The website from General Directorate of Residency – Dubai has the facility to check the Dubai visa status and information about DNRD applications. 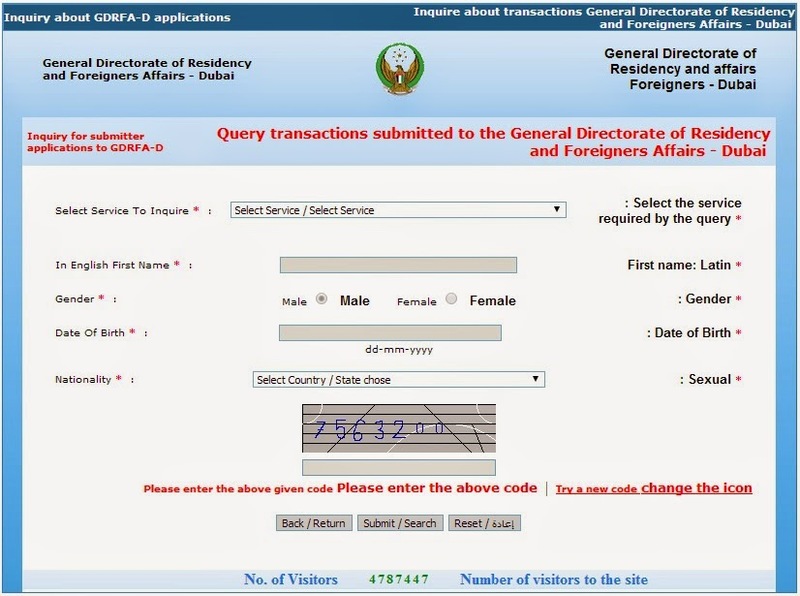 The GDRFA site provides a Query DNRD App page to check about the visa status and other immigration applications. The status of following immigration forms applied in DNRD can be checked through the Dubai immigration portal by entering the basic application information like smart form number or application number. The current status of your visa can also be checked by entering the visa number. Residence Application Status – This will show the status of passport that has been submitted to DNRD for visa stamping as whether it is processed or not. Dubai immigration also started a smart mobile application from their website for checking the status and validity of visit visas and other immigration transactions. The new mobile service from General Department of Residency and Foreign Affairs in Dubai will enable the public to check about the status of Dubai visas and other immigration transactions. OK to board is a requirement for airlines to make sure that the passenger has a valid visa to the point of destination. This should be made by showing the original visa either at origin of travel or at destination in the airlines office prior to the travel by anybody and pay the fees to issue the Ok to board status.